The New York Post has finally paid for its idiotic and disgusting decision to imply that Salaheddin Barhoum and Yassine Zaimi were responsible for the Boston Marathon bombing. The two men sued the Post after it published a cover labeling them “Bag Men.” That lawsuit was just settled, according to The Associated Press. When the Post cover hit newsstands, little information was known about who committed the terrorist attack. Barhoum and Zaimi immediately felt the wrath of people who wrongfully blamed them after seeing their faces plastered on the cover of the paper. The Post, meanwhile, stood by its story, claiming that they never identified the men or specifically named them suspects for the bombing. 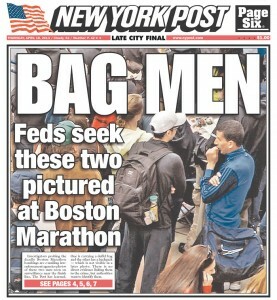 Right, because “BAG MEN” and “Feds Seek These Two Pictured at Boston Marathon” is quite ambiguous. The financial terms of the settlement weren’t disclosed, but we hope Barhoum and Zaimi squeezed all they could out of the Post.